What is the best way to ensure that you don’t end up with squash-cumbers? 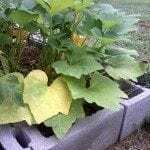 SquashPruning Squash Leaves - Should You Remove Squash Leaves? Just don't reuse seed from the crops if you have them planted near each other. This does not happen often, though. I wouldn't worry about this. Just make sure that you have enough calcium in the soil. I recommend dolomitic lime. This will keep your cucumber and squash healthy and fruiting properly.